After our very busy multi-week visit to Glacier National Park, including the isolated and breathtaking eastern side and the much more crowded west side of the park, we were ready for some serious downtime. 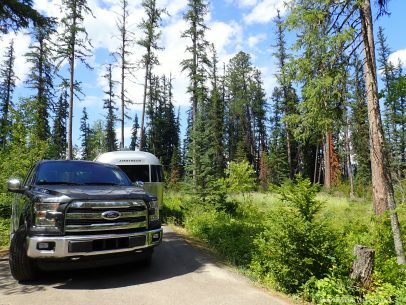 We found it by moving just 20 miles from Glacier, into a small campground in the Flathead National Forest. 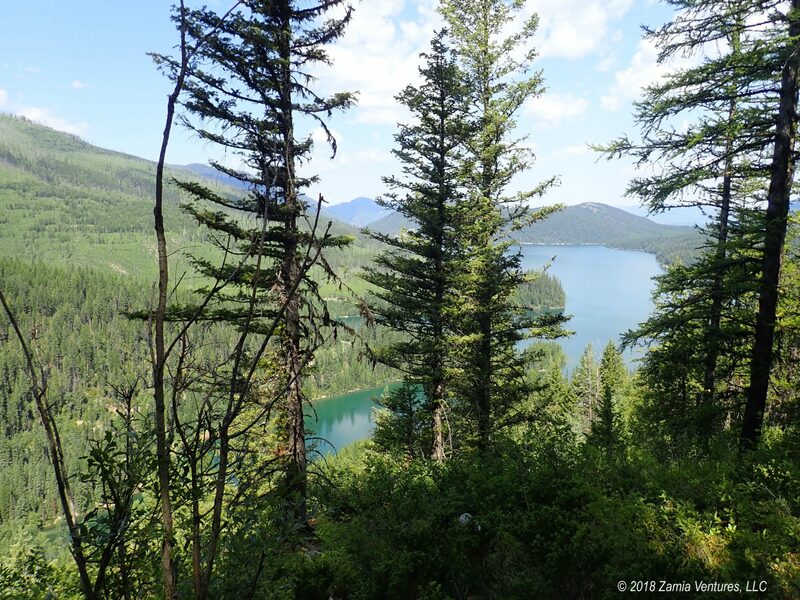 The biggest defining feature of the forest is the enormous Hungry Horse Reservoir, an artificial lake created by damming the South Fork of the Flathead River at the Hungry Horse Dam. While not one of the largest dams in the world, at 564 feet high the concrete dam is still an impressive structure. The resulting reservoir stretches for 25+ miles beyond the dam, and the frontal view of the dam and never-ending lake framed by high mountain peaks is pretty arresting. Being camped next to the large man-made reservoir and driving across the dam itself every time we left or entered the campground led us to amusing ourselves all week with incredibly lame dam-related humor. The docent at the visitor center was a good sport, however. When we asked him to “give us some dam information!” he almost completely suppressed the natural urge to roll his eyes and sigh at us. The visitor experience wasn’t nearly as immersive as at Fort Peck – there was no visit to the power station at all, and certainly no chance to touch a spinning generator shaft! – but the visitor center was still interesting. Construction of the dam was a lengthy and complicated process, thanks to Montana’s harsh and long winters. This dam is one of the easternmost in the series of dams that dots the entire Columbia River watershed, working together to generate clean power throughout the Pacific Northwest. I also enjoyed learning about modern changes to water management practices to better emulate the normal flow and temperature of the river, which has greatly improved the number and size of fish living in the river downstream from the dam. There are quite a few campgrounds within this particular national forest, and the one we selected (Lost Johnny Point) has about two dozen sites located on the southwestern shore of the reservoir. Since we dropped in for one of the first-come, first-serve sites, we weren’t able to snag a site that backed up directly to the water, but we did manage to secure a site with a lot of open sky so solar power generation was no problem. We loved the quiet of being out in the national forest, and we had frequent visits to our campsite from deer, hummingbirds, chipmunks, and many other creatures. As an added bonus, our campsite was lined with blueberry and huckleberry bushes, with the berries just reaching ripeness, making for easy snacking while spending time at the campsite. No close neighbors at all! The reservoir was a hive of activity on the weekends, as a major destination for people using boats to fish, wake board, and more. 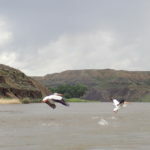 During the week, however, it was almost deserted except for a few other occupants of the campground who hauled their kayaks into the water. Except for a morning spent running a few errands, we ended up spending most of our time near the campground, where I binge-read at least a half dozen novels on my Kindle and worked on some new recipes. We also did some relatively brief hiking in the national forest, where we once again found that the thick ponderosa pine forests made it hard to get really sweeping views over the landscape. In spite of this, we really enjoyed hiking on the trails since there were very few other visitors in the huge and lush forests. This low-key week was excellent preparation for our next busy period: a week in Missoula, the largest town in western Montana, where plenty of urban adventures await us. You guys seem to have struck a nice balance between sightseeing and downtime, urban areas and wilderness treks, etc. Right from the beginning, we knew we needed to travel slowly and we were always good about sticking with our mileage and length-of-stay rules, but I’ve really started focusing on switching off between high intensity places and low key stops. Right now we’re sitting at a quiet campground in the middle of nowhere Idaho. It’s just what the doctor ordered after 11 days of running around Yellowstone and visiting with friends and dealing with other crazy life stuff. The downtime makes the up-time manageable.